Great Britain claimed its first Junior Davis Cup title today in Mexico, with Evan Hoyt beating Stefano Napolitano 6-4, 6-3 at No. 2 singles and Kyle Edmund defeating Gianluigi Quinzi 6-3, 6-4 at No. 1 singles to sweep No. 2 seed Italy 2-0. Great Britain, seeded No. 1 this year, had reached the final two years ago, losing 2-1 to Australia, but this year there was no doubt they were the top team, as the only point they lost was a dead rubber in doubles. The top-seeded Australian girls took the Junior Fed Cup, with Belinda Woolcock beating Carol Zhao 6-1, 6-3 at No. 2 singles and Ashleigh Barty defeating Francoise Abanda 6-2, 6-3 at No. 1, to emphatically defeat the second-seeded Canadians. Australia last won the Junior Fed Cup in 2007, when Sally Peers led her team to a 2-1 victory over Poland. For more on the finals, see the ITF junior website. 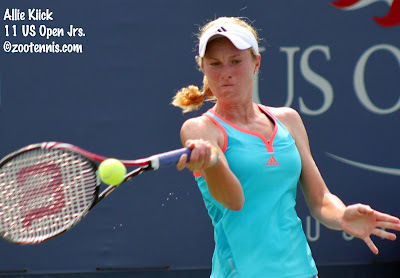 Sixteen-year-old Allie Kiick won her first title on the ITF Women's Circuit today, defeating Chalena Scholl 6-7(5) 6-2, 6-3 at the $10,000 tournament at Amelia Island. Both girls were unseeded. Alexa Glatch lost to top seed Romina Oprandi of Italy in the Las Vegas $50,000 Challenger final 6-7(2), 6-3, 7-6(3). Glatch and partner Mashona Washington won the doubles title 6-4, 6-2 over Melanie Oudin and Varvara Lepchenko. At the $10,000 Laguna Niguel Futures in California, top seed Denis Kudla won his first (correction: second--he won Austin Futures last fall) professional title, defeating Dennis Lajola 6-4, 6-0. Former Tennessee Volunteers Ben Rogers and JP Smith won their third Futures title, but first since July, beating Yaoki Ishii and Yuichi Ito of Japan 6-3, 7-6(3). Find results from this week's finals and today's qualifying for next week's three tournaments at the Pro Circuit page at usta.com. At the ITF Junior Grade 5 in Waco, Peggy Porter and 13-year-old Stefan Kozlov swept the singles and doubles titles. Porter, the No. 3 seed, beat unseeded 14-year-old Olivia Hauger 6-1,7-6(9) to win her second consecutive ITF event. Kozlov, seeded sixth, won his first ITF singles title in his third trip to a final, beating unseeded Martin Redlicki 7-6(2), 4-6, 6-4. Porter and Makenzie Craft won the girls doubles, with Kozlov and Dan Kerznerman taking the boys doubles title. Hi Colette: I'd love to see that breakthrough from Glatch. I guess with her it's a matter of staying healthy? I'm sure you've been following her game for a while: What do you think it'll take for her to get to the top 50?